It was just few weeks ago that Isabel's temperature soar to 103. I couldn't put a cool rug in her forehead as she moves constantly. 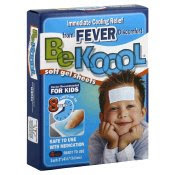 So, I bought this BE KOOL in Walgreens and stick it to her forehead at night time to kept her temps down. It acts fast and she sleeps much better. I recommend this to all mommies out there. It also comes in adult size. It is now a must have in my house hold. thank you for this mommy elaine. di pa naman nagkalagnat ng ganyan kataas si gav. we hope isabella is doin great! That was few weeks ago Trish when Isabel had Pneumonia. Hirap talaga ang bata pag may sakit. This is really a cool stuff to use. I'm glad i bought it.